Right Now you have got your kit and your ready to go , or are you! I use a 60/40 lead tin mix made by mulitcore but any similar stuff will do, if your buying it for the first time then look for some around 0.5-0.6mm dia stuff. Now onto building, first read the Instructions from front to back, next read the instructions from front to back, yes read them twice . Now find something like the foam that gets used in flower arranging, or even polystyrene packing will do, failing that a number of paper cups. Don't panic if you are having problems, if you use your multimeter set to ohms you can read the values that way or if you look at the instructions part list it tells you what colour each resistor is, the resistor all have a 4th band too, this is to do with the accuracy of the value indicated and we need not worry about that in this design. do this for all the resistors. pop all the same value capacitors in the same cup or group on the foam . The capacitor values are printed on each device , this can be VERY small writing so get out that Magnifying glass. 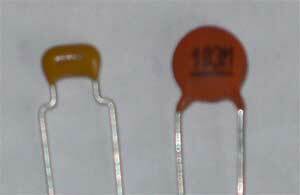 we have 3 different type of capacitors in this kit we have Ceramic disks. small brown disc types , these normally have a value printed on one side such as 103M this is 0.01uF, 104 would be 0.1uF , 222 would be 0.0022uF, if you look again at the parts list there is a column called "Identification" which tells you what to look for on each capacitor. Epoxy Cap on Left, Ceramic cap on right. These two types of components account for about 90% of the parts in the kit so we will talk about the other parts as we fit them. Ok have a cup of coffle and a break and then we will move on to the next bit.